NCAA Well Represented at Worlds - College Hockey, Inc.
Eleven teams at the World Championship feature NCAA representatives. Two-time first-team All-WCHA selection Marc Michaelis is one of three current NCAA players at the IIHF World Championship. Thirty-SIX current or former NCAA players are competing in the 2018 IIHF World Championships that begin Friday in Denmark. Eleven of the 16 teams in the tournament feature at least one NCAA representative, led by the United States entry with 17 college players. All U.S. games, beginning with Friday’s opening game against Canada (10 a.m. ET), will be televised on NHL Network. The gold- and bronze-medal games are set for Sunday, May 20, in Copenhagen. Three of the participants played college hockey this season. First-round NHL Draft prospect Quinn Hughes (Orlando, Fla./U.S. NTDP) of Michigan is the lone current college player on the U.S. team after his second-team All-Big Ten freshman season. 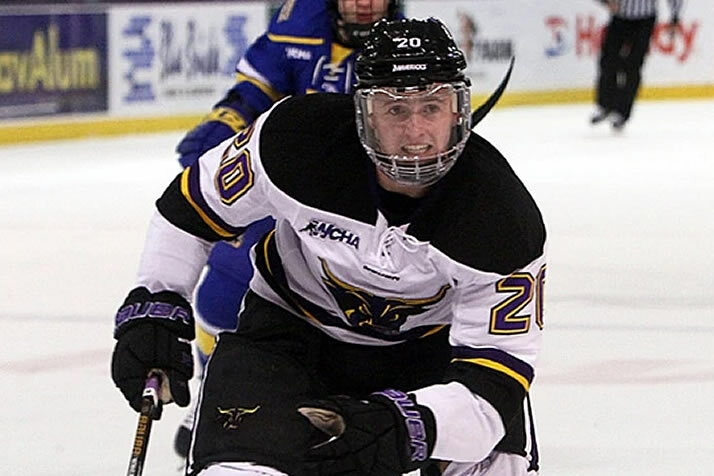 Minnesota State sophomore Marc Michaelis (Mannheim, Germany/Green Bay-USHL) is the second Maverick in as many years to play in the tournament, following teammate Daniel Brickley last season. Michaelis is a two-time first-team All-WCHA selection. North Dakota sophomore Ludvig Hoff (Oslo, Norway/Lincoln-USHL) represents his country for the second time this season after also appearing in the Olympics. Hoff had nine points in 25 games this year for the Fighting Hawks. Colleges are also represented behind the benches, highlighted by former Ferris State goaltender and Western Michigan head coach Jeff Blashill leading the U.S. team. He is assisted by NCAA alumni Dan Bylsma (Bowling Green) and Don Granato (Wisconsin). Swedish head coach Rickard Gronberg played at St. Cloud State, while UMass Lowell alum Laurent Meunier is an assistant with France.